School started this week in Denver. Colorado is sweltering, setting temperature records almost every day, and I teach in a beautiful, one hundred year old, non-air conditioned building. Despite the heat, I've watched brilliant young teachers do wonderful work with kids all week. On Tuesday, for example, I saw a seventh and eighth grade teacher, new to our building/state, new to this population of kids, share this poem with kids. And kids who had never paid one bit of attention were leaning forward, highlighters in hand, amazed, I think, that this teacher already knew who they were. Read the rest the poem here. (The poem is posted in three parts, so be sure you go to the bottom left corner and read all three pages). 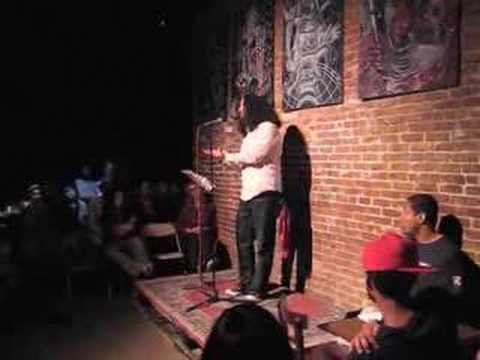 Watch Bonafide Rojas perform the poem here. Tara is hosting today at A TEACHING LIFE. My first full official week back at school. Teachers started Tuesday and our kids start Monday. I can't wait! In the meantime, like most other teachers, I'm crazy busy and exhausted. This poem, "The First Day of School," is one that I have probably used almost since the beginning of my career, a very long time ago, but I think it's still applicable to most teachers and kids. "The First Day of School"
or I (oops!) drop my lunch someplace like the toilet? Will they let me starve or will somebody lend me a sandwich? A cookie? A cracker? An apple? Some juice? And what if they say, "Do this," and I don't understand them? And what if there's teams and nobody picks me to play? And started the first day of school on the second day? Betsy is hosting Poetry Friday is at I Think in Poems. Many years ago, long before I was a mother, I heard Shelley Harwayne in a workshop. Shelley said, "To be a mother is to forever wear your heart outside your body." At the time, I don't think I understood what she meant. I do now. Ten days ago, I went down to Arizona. I flew into Phoenix, spent about six hours with Son #1, and then drove over to Thatcher, to see Son #2 and outfit his dorm room. While I was in Phoenix, Son #1 told me that the coaches asked if he wanted to redshirt this year. For those of you who are not sports people, red shirting is a technique they use in college football to give a player an extra year of eligibility. The player is on the team, and practices with the team, but never gets to play in games. Coaches redshirt players that are not quite ready for college ball, or with players that have been hurt. My son tore his ACL last October. He has been cleared to play by the doctors, but the coaches don't feel like he is as fast as he was, and they want him to heal for another year. "They said it's my decision," said my son. "I can do what I want." All weekend long, he vacillated. He wanted to play. He wasn't going to red shirt. He was going to wait for the depth chart to come out. He wanted to play, but not if he had to play third or fourth string, and wouldn't get playing time. He had two more practices and a scrimmage and he was going to show the coaches that he was ready. He wanted to play. And all weekend long, my heart broke for him. My guy loves, loves, loves his football, pretty much more than life itself. School has never been easy for him. He struggles to maintain a 2.0 GPA. But football, well, that's different. Football is Zay's happy place- the place where he feels strong and sure and confident. He was offensive player of the year two times in high school. Was team captain his junior and senior year. And now, it seems, even football is being taken away. On Monday night, Zay called me after practice. He had decided to red shirt. I fought to keep my voice even, to swallow the lump in my throat, as he said, "It will be ok. I just need you to support me." And so all week, I have tried to support him. Told him how much I loved him. How proud I was, that he had gone down there, 900 miles away, and stayed, even after the other three kids he knew quit school and came back. Told him I knew that God had big plans for him. Told him that it would be ok. That he would get to play next year. And then, every time, I have gotten off the phone and cried. Every single night. Between preparing for the beginning of the school year, teaching two classes (and responding to 30+ final projects), and getting a son off to college, my blogging has been woefully lacking as of late. Actually, so has my reading, as I have spent every spare minute reading final projects. 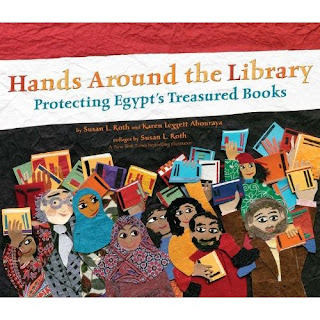 On Saturday, though, I couldn't stand it any more and I headed to the library, where I found a new wordless picture book. 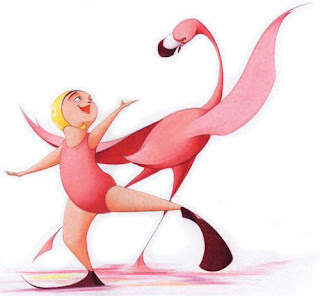 FLORA AND THE FLAMINGO by Molly Idle is the story of a graceful dancing flamingo, and Flora, a little girl, clad in a yellow bathing cap, pink bathing suit, and gigantic flippers, who is, well, not so graceful, at least not at the beginning of the book. On every page, the flamingo assumes a new and graceful dancing pose. And Flora, well, Flora tries to assume the same pose. 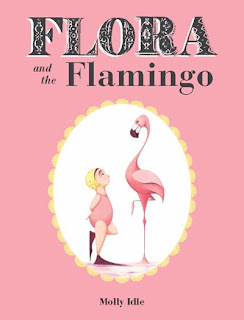 At first, the flamingo does her best to ignore Flora. But then the inevitable happens, and the two become friends. 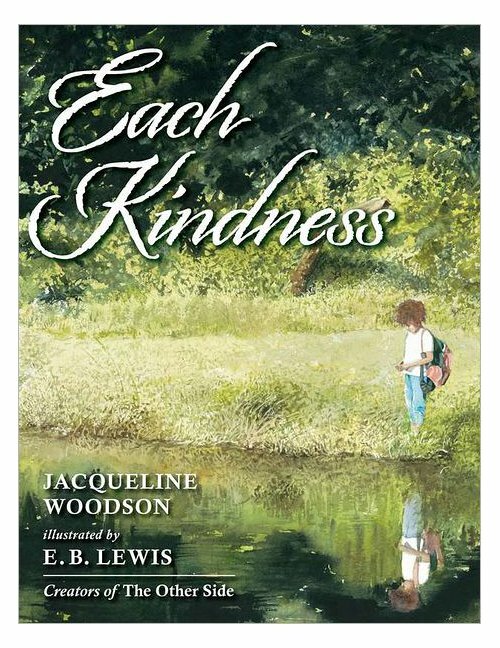 This is one of those absolutely perfect picture books. So perfect, in fact, that I kept thinking, as I was reading it, "Is this the next Caldecott?" 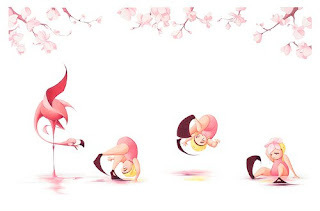 The image of movement and dance, and the lines in the pictures made me keep looking and looking and looking, even though I'm not usually all that patient with wordless picture books. And there are even a few bonus lift the flap pages for the kinesthetic learners in the crowd. Our family does not do many things in ordinary ways. Take this leaving for college thing, for example. I know, or at least I've heard, how it's supposed to work. The way I understand it, in most families, kids spend their senior year applying for college. They take ACT's, visit a few colleges, apply, debate their OPTIONS, and finally make a choice. Then they graduate, and spend the summer sorting through high school mementos and visiting Bed, Bath and Beyond, and packing. And then, in late August, they leave. That's most families. But that's not how we do it in our family. About two weeks ago, the stars aligned, and things fell into place, and my younger son decided he would go to college. Nine hundred miles away from home. In 48 hours. Seriously. I'm not kidding. On Thursday night, he talked to a football coach and rush ordered new football cleats (when you have size 17 feet you can't just go into a store and buy shoes, you have to special order them). On Friday, he went and got a new driver's license and I made plane reservations. On Saturday, we went and shopped for sheets and towels, and bought a suitcase. I also helped color a pair of pink cleats with a black sharpie, but that is a whole other slice. And on Sunday morning, he got on a plane with his football coach and moved to Arizona to go to college. Since then, I have made four trips to the UPS store. The first time, I mailed a bag of shoes, because somehow, he had gotten to Arizona with his Jordan sandals and his football cleats. The second time, I mailed the new football cleats. The third trip, I mailed his special pillow. 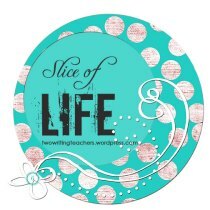 And then today, I mailed the long board (but that is also a story for another slice-- too bad this isn't March, because I have plenty to write about). I also went to Arizona last weekend. I stopped in Phoenix and stocked Son #1's refrigerator. Then I drove three hours east to help Son #2 get settled. I bought a microwave and dorm refrigerator. And a special pillow, because the first one I mailed never got there. Or at least it didn't get there until after I bought the second one. And I sat through a scrimmage in a monsoon. And paid an extra $175 for a replacement ticket (but that is a story for another slice). And now I am back in Denver. Trying to pretend that it's ordinary for our house to be so very, very quiet. 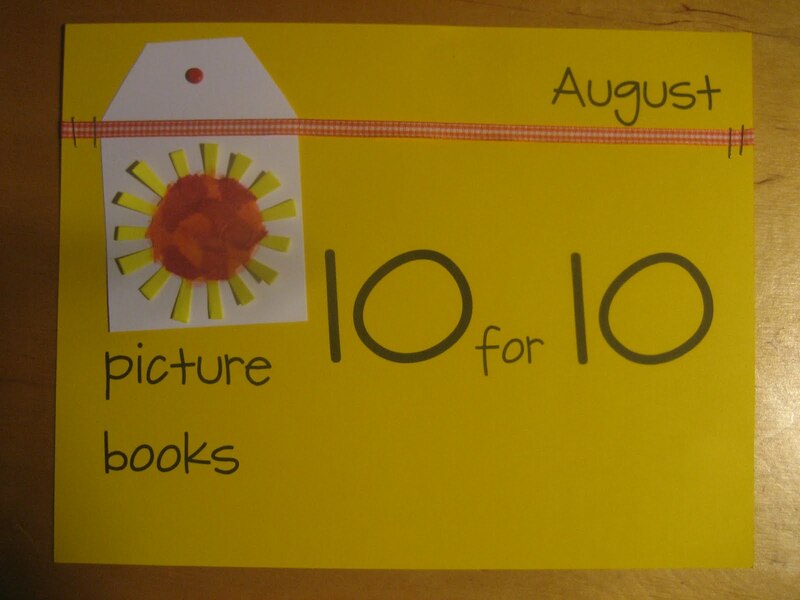 It's been a crazy couple of weeks and I wasn't even sure I was going to be able to pull off a Picture Book 10 for 10 post this year. I have done it for the last few years though, and couldn't stand not to participate. I'm in Thatcher, Arizona this weekend trying to get my younger son settled in college, but between trips to banks, and buying things for his dorm room, and a rained out football scrimmage, I've managed to throw together a list of books I have loved using with intermediate and middle grade kids in the last year. Can't wait to read every one else's lists! (But first I have to hide my debit card). Just love this book about an alleged tough guy who is adopted by a group of fuzzy bunnies. Lots of fun but also lots of rich conversation and big truths about life. 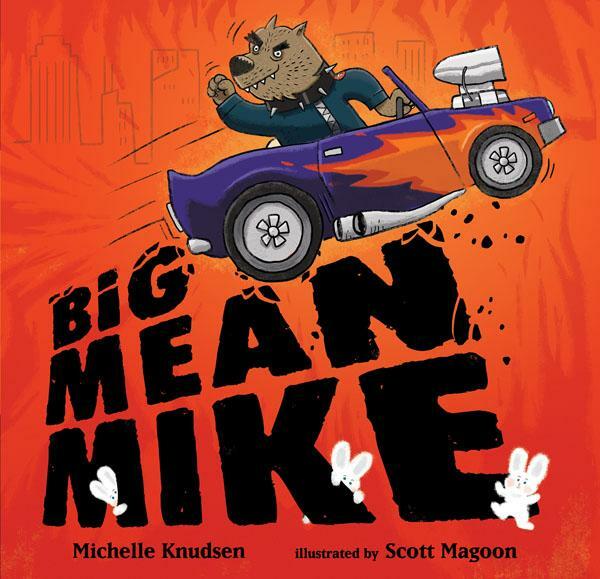 Another book that leaves kids thinking about how people treat each other and about the power of our actions. A powerful picture book about a group of ordinary citizens who banded together to protect the Library of Alexandria from protestors. Susan Roth's collage illustrations (Dream Something Big and Listen to the Wind are two of her most recent) are just about perfect. Of course I have to have a dog book (or two) on my list of favorites. 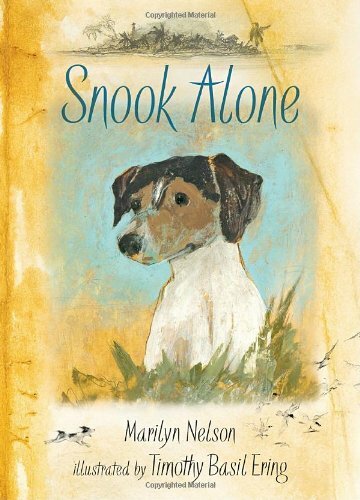 Snook is a terrier, the companion of a monk named Abba Jacob. When Abba Jacob has to make a trip to an island, Snook goes along. 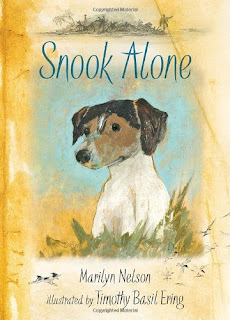 A storm comes up and Snook is left behind. A beautiful story of loneliness and loyalty. 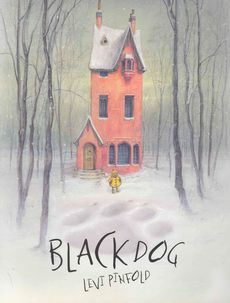 My dear friend, Kyle, introduced me to this book about an "enormous" black dog that takes up residence in a family's yard. Great for discussions about theme or author's message. 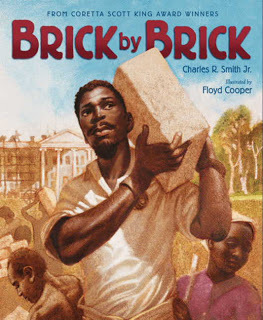 A beautiful and poetic picture book about the slaves that built the White House. 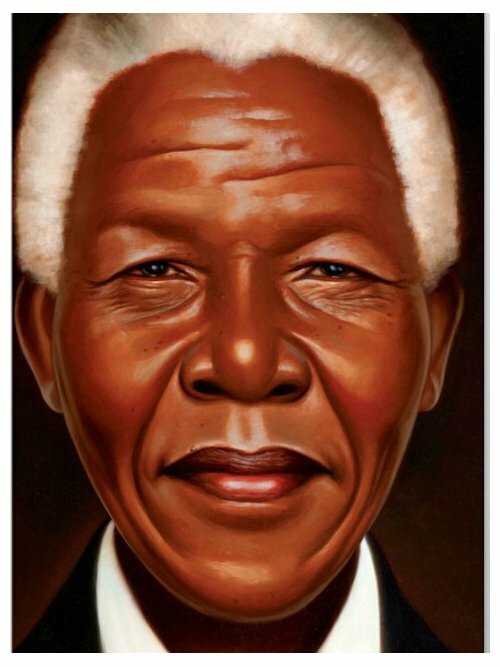 Kadir Nelson is one of my all time favorite picture book authors and illustrators. I love, love, love his work, and this biography is no exception. Also loved Nelson's I Have a Dream. 8) The Mystery of Darwin's Frog by Marty Crump, illustrated by Steve Jenkins and Edel Rodriguez. Another favorite author/illustrator. 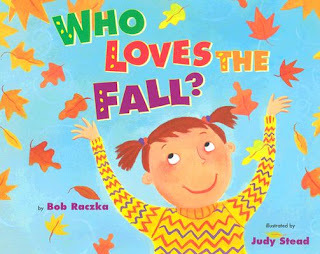 I on't think I could ever have a list of favorite picture books without at least one mention of Steve Jenkins. 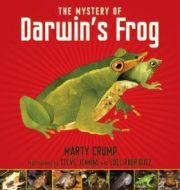 Crump, a Utah herpetologist, invites readers into the world of scientists, tracing the evolution of the body of knowledge about a tiny frog with a pointed noise, who was discovered by Charles Darwin in Chile in 1834. Fascinating look at how scientists build on each other's work. A smorgasbord of some of the most talented artists illustrating books today, including Bryan Collier, Jon J Muth, Diane Goode, Mary GrandPre, Raul Colon, Sonia Lynn Sadler, Yuyi Morales, John Hendrix, LeUyen Pham, and Chris Soentpiet- present their interpretation of Katherine Lee Bates' famous song. Each illustration is accompanied by a presidential quote. 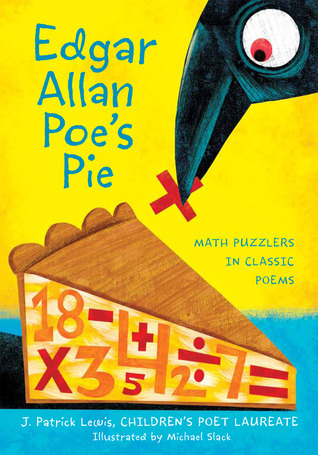 And finally, a book of silly, fun, and mathematical poems and riddles. Be sure to head over to Cathy Mere's Reflect and Refine or Mandy Robek's Enjoy and Embrace Learning to see lots of other terrific lists. And make sure to follow the hashtag on Twitter. It's August and I'm thinking, pretty much nonstop, about going back to school. Every year, one of the very first things I do is prepare for read aloud. I grab a big wicker basket and fill it with great read alouds. Then I put that basket in our reading corner, right next to the rocking chair. After that's done, I can do the less important stuff, like moving desks around and sharpening pencils. I teach (and have always taught) in urban settings. Most of my kids don't have a lot of experience with read aloud. Some don't even have much experience with books. I work really hard, then, to make sure that our first read alouds are fun. I look for books with language that sticks in kids' mouths and minds and hearts. I want the kind of books that kids chant on the playground at recess and go home and share, verbatim, with their families and younger siblings. I want books that they search out and share (and ok, sometimes even fight over, in our classroom). Poetry fits the bill perfectly. 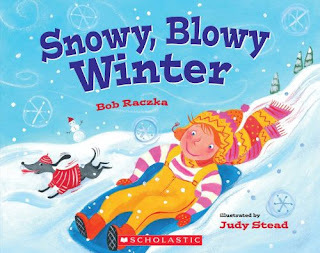 One series I have loved for the past several years is Bob Raczka's collection on seasons. 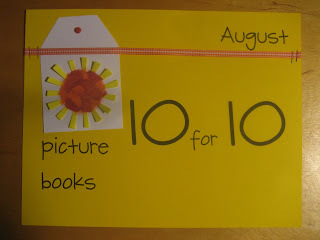 These books are simple- usually just one word or sentence on a page. The language is strong and memorable, e.g. "Divers, swimmers, flat rock skimmers. "Six more weeks of snowy blowy...seedy squirrelly winter!" And a few added bonuses. We can revisit the books later during mini-lessons on unknown words, parts of speech or suffixes. 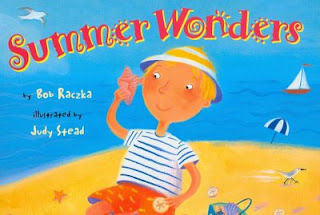 Also, Raczka has lots and lots of other books for kids to discover/love a little later in their reading lives. Two of my favorites are LEMONADE and GUYKU. 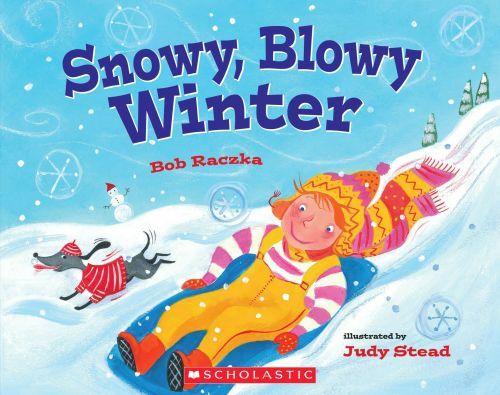 And some really good news- the publisher, Albert Whitman and Company, has donated a copy of SNOWY BLOWY. Make a comment down below and I'll draw a name tomorrow around noon. Even more good news-- Albert Whitman is giving away books all over kidlitosphere this weekend. To see a complete list of the giveaways, head over to the Albert Whitman website. Margaret is hosting POETRY FRIDAY at Reflections on the Teche.